Practice Chemical Process Calculation questions and answers for interviews, campus placements, online tests, aptitude tests, quizzes and competitive exams. This set of Chemical Process Calculation Multiple Choice Questions & Answers (MCQs) focuses on “Saturation”. Explanation: Antoine equation is a relation between Vapour pressure and Temperature. Where: p* & T are Vapour pressure and Temperature respectively and A, B & C are constants. Explanation: ln(p*) = A-B/(C+T) is the correct representation of Antoine equation. Explanation: The temperature at which the vapour just start to condense at a specified pressure is Dew point. 4. At dew point the partial pressure of the is equal to the partial pressure of the volatile liquid. Explanation: At dew point the partial pressure of the is equal to the vapour pressure of the volatile liquid. 5. What is the pressure of Air? Explanation: Pair = Ptotal – p*. 6. What is the composition of vapour? 7. What is the composition of vapour? 8. Dew point of water at standard conditions is? Explanation: Dew point of water at standard condition = 100 Degree Celsius. 9-10. Water vapour of 5 KPa at 300 K is saturated with air in a system. 9. What is the mole fraction of air? Explanation: Mole fraction of air = 101.3/(5 + 101.3) = 0.952. 10. What is the mole fraction of vapour? Explanation: Mole fraction of air = 5/(5 + 101.3) = 0.047. 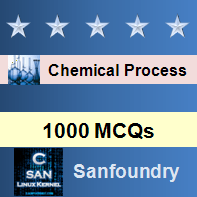 Sanfoundry Global Education & Learning Series – Chemical Process Calculation. To practice all areas of Chemical Process Calculation, here is complete set of 1000+ Multiple Choice Questions and Answers.